Where Does your Trumpet Come From? Are you a trumpet player? Good for you! I’m not, but I have tried to play the trumpet. It is a great instrument! My brother played trumpet when we were growing up, and one of my sons plays trumpet. So I have learned some things about the trumpet from them. Do you know anything about the instrument’s history? You should. If you stretched out all the tubing of a trumpet it would be almost 5 feet long. A pair of ancient trumpets was found in the tomb of King Tutankhamun (King Tut) of Ancient Egypt. Toyota built a trumpet-playing robot. Check it out! The largest playable trumpet ever built is about 105 feet long! If you are traveling to Indonesia, you should look it up. But don’t think about trying to play it! It can only be played with an air compressor. Cornets and trumpets are similar instruments. They are played the same way and use the same fingerings, but they are not exactly alike. Cornets are somewhat smaller than trumpets and have conical bores. The sound of a cornet is a bit more mellow than the sound of a trumpet. Trumpets are larger, have cylindrical bores, and have a brighter sound. 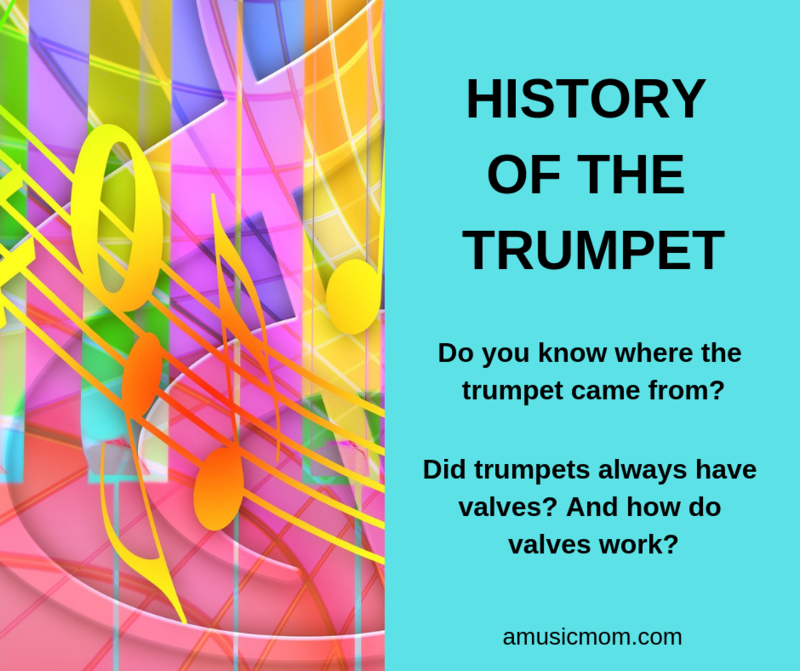 Where Did Trumpets Come From? Trumpets have been around in one form or another for a long time – maybe about 3000 years. But those early instruments looked nothing like a trumpet of today. Historians believe the earliest trumpets were hollow pieces of wood, maybe hollowed out by insects. In time people began making some trumpets out of bronze or silver. By the 1500s trumpets were being made from metal. But there were problems with these trumpets. They were not able to play all the notes musicians and composers wanted to use. Basically, these instruments were just straight tubes with no holes or valves, no way to change notes, except by changing the embouchure and air speed. How could they make the trumpet so it would be able to play more notes? People started thinking about solutions to the problem. The first idea they tried was to have the musicians use two or more trumpets of different lengths. When they needed to play notes that one horn couldn’t play, they would switch to a different horn. This allowed them to play more notes, but it was a rather awkward method. It also wasn’t so easy to carry around two or three long horns at a time. Time to try a new idea. Slides on a Trumpet? Hands in the Bell? So, they tried adding slides to the trumpet. Well, that allowed the instrument to play more notes, but it made the horn awkward to play. Scratch that idea. Someone suggested that if a trumpet player put his hand in the bell, he could adjust his hand to produce different notes. But wait! Those trumpets were still really long! It was hard to reach the bell! In 1777 they decided to bend the instrument to make it easier to reach the bell. This may have helped a little bit, but it caused more problems than it solved. Back to the drawing board. In 1839 someone decided to include some valves and extra tubing on the trumpet. And the rest, as they say, is history. What does a Valve Do? A valve makes a way to redirect the air through different bits of tubing to produce different sets of notes. When you blow through a trumpet you can get several notes without pushing down any valves. You can get C, G, C, E, G, all without using any valves. When you use the first valve you can get B♭, F, B♭, D, F, etc. When you push down the second valve you can get a different set of notes. The valve you push down directs the air through a different piece of tubing to produce the different notes. By using different combinations of the three valves, a trumpet player can produce all the notes he needs to play his music. What are Trumpets Made Of? Most trumpets today are made of brass. Brass is an alloy (a combination of metals) made of copper and zinc. Sometimes the brass is either silver or gold-plated. That is how you see silver trumpets in band or orchestra. The horn itself is not made of silver, just covered in a silver coating. Many valves are now made of Monel. Monel is a very specialized alloy – it is very hard, and very resistant to corrosion and acid. The Monel alloy was patented in 1906. How would you describe the sound of a trumpet? Your sister probably just says it is loud! Or maybe annoying. But in the music world, the trumpet sound is called high and brilliant. The sound can carry over a long distance. It is easily heard – which explains why it was often used in battles as signals for the soldiers. Have you ever heard a piccolo trumpet? Piccolo trumpets are cool! They look like a trumpet, but are smaller, and play higher than a regular trumpet. The tubing of a piccolo trumpet is half as long as the tubing of a regular trumpet. And the piccolo trumpet sounds an octave higher than a regular trumpet. The Beatles even used a piccolo trumpet in one of their songs. I hope you learned something new about your instrument. Share this with your trumpet friends! 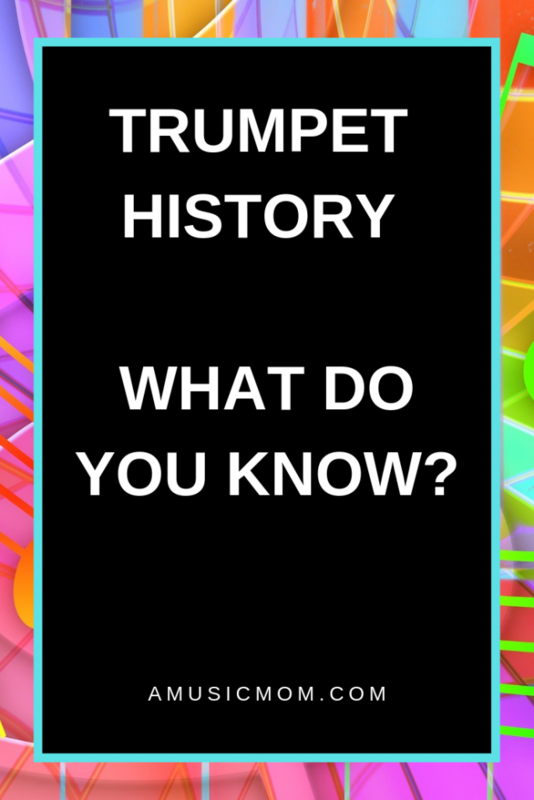 Author amusicmomPosted on February 10, 2019 February 10, 2019 Categories Music HistoryTags History of Trumpet, Instrument History, TrumpetLeave a comment on Where Does your Trumpet Come From?